Chocolate Custard Roll Recipe - Let the Baking Begin! All the richness and deliciousness of a Bird’s Milk Cake aka Ptiche Moloko cake in the shape of a roll. 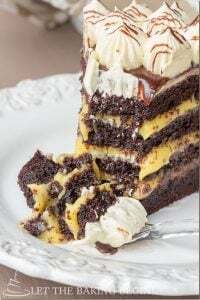 The Chocolate Angel Food Cake combined with the Egg Yolk only Custard Buttercream is quite magical together, especially when you add a good downpour of Chocolate Ganache on top. This Chocolate Custard Roll is a true beauty my friends, true beauty! and for the full cultural experience went through the Pike’s Market. Lilacs, which remind me of my late grandma’s huge Lilac tree bush which she had in her front yard were in season, so we got a huge bouquet to take home. With me in nursing school, it has been a while since we have gotten away anywhere, so everyone really enjoyed the trip. When we got home, we got to enjoy the little piece of the Chocolate Custard Roll that was left from the previous day. It was the perfect ending to a wonderful trip and a wonderful Mother’s day. Check the story behind the original recipe here. In a saucepan combine 10 egg yolks with 3/4 cup sugar and vigorously whisk until smooth. Right away, whisk in 3/4 cup whole milk. Set over medium heat and while continuously whisking cook until thickened. The custard should coat the back of the spoon nicely. Do not bring to a boil or the mixture will curdle and become unusable (you will need to start over, if this does happen). Allow to completely cool to room temperature. In a mixer, whip 3 sticks of unsalted room temperature butter until very pale in color and drastically increased in volume, scraping the bottom of the bowl about 2-3 times throughout, about 5-7 minutes. In 2 additions, whip in the cooled egg yolk custard, minimally whipping in between. Take away about 1.5 cups custard buttercream and set aside, this will be used to decorate the outside of the roll. Prepare all ingredients by measuring them with a kitchen scale. Line a Jelly Roll Baking Pan with foil or parchment paper. Heat oven to 350F with the baking rack in the middle. Add 240 grams of egg whites to an absolutely grease free, thoroughly cleaned large bowl and start whipping on high until foamy, about 30 seconds. Slowly pour in 300 grams of granulated sugar as you continue to whip, then whip for 7 minutes more. Set a fine sieve over the bowl with whipped egg whites, add 120 grams of all-purpose flour and 40 grams of cocoa powder and sift. Now carefully fold the sifted mixture and meringue together until almost no streaks of dry mixture appear. You do not want to overfold, as that will make the cake dense. Transfer the batter to a parchment lined jelly roll baking sheet (18in x 12 in) and spread into an even layer. Bake at 350F, for about 10-15 minutes, or until a toothpick inserted into the center comes out clean. Remove from the oven and allow to completely cool. Do not open the oven to check sooner than 10 minutes, or the cake will deflate. Turn the cooled cake upside down and peel off the parchment paper. Turn the cake back top side up. Spread the custard buttercream into an even layer on all over the cake except for 2 inches on the short side of the cake (see picture). Tightly roll the roll towards the end with no buttercream, leaving it seam side down. Cover in plastic wrap and refrigerate for about 30 minutes to 1 hour. Remove from the fridge, set over a cooling rack and remove the plastic wrap. Spread about half of the reserved cream all over the roll, about 3/4th cup. Combine 1/4 cup hot heavy cream and 1/3 cup chopped chocolate or dark chocolate chips and let sit for 1 minute. Stir until smooth. 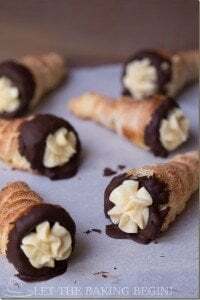 Allow to cool to room temperature or until the ganache is pourable but thick. Pour the cooled prepared ganache over the roll. Add the remaining buttercream to a pastry bag (or a ziplock bag) fitted with a star tip and pipe flowers/stars all over the top of the roll. 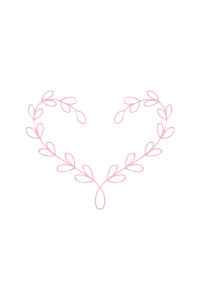 Make some big flowers and small ones. If you wish, you can add White Chocolate Crispearls to the centers of each piped flower. Any kind of small round chocolate covered dry blueberry will do though. With large spatulas transfer the Chocolate Custard Roll to a serving plate and refrigerate until ready to serve. For nice clean slices, dip a knife into hot water, wipe and proceed to cut. 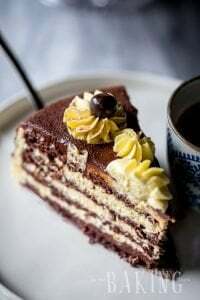 Chocolate Kiev Cake Recipe – Chocolate cake with walnuts, meringue, and dulce de leche. 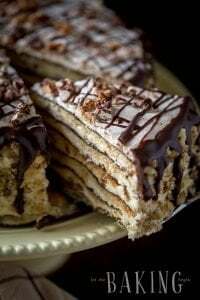 Best Napolean Cake – A soft and delicious cake recipe. 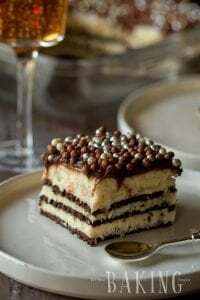 Chocolate Cake – A soft chocolate cake with an Irish cream mousse. You and your family are adorable. Love this recipe.